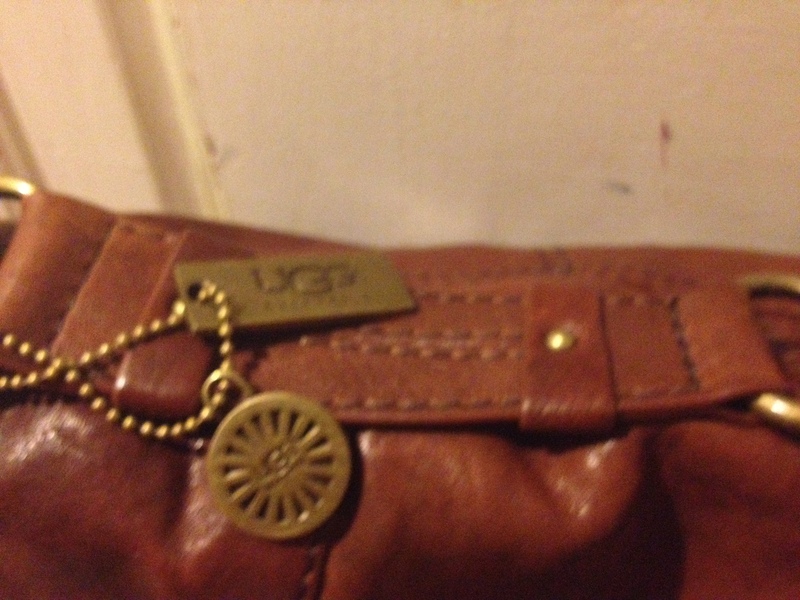 this ugg purse is one of my favorite scores from my spot, goodwill. i got it the same time i got my famed stolen calvin klein purse. sometimes, when it rains, it pours at that location, like my recent trip. i got this for $10, half off of $20. this is some of the softest leather that isn’t pebbled or italian. i didn’t have anything like this, so it was a very welcome addition to the family. several of my friends have begged me to let them have this purse (you know who you are). the answer is no. when will i ever be able to afford a purse like this unless i get it at a resale store? the 12th of never, that’s when. confession: this was hard to write today, because a friend of mine said on facebook that i should auction all of these purses off on the last day to “cleanse my soul”. this has really bothered me. the whole reason i took this on was to do something for myself, learn something about myself, and perhaps about my love of bags. i don’t think my soul needs cleansing. at least, not the way he suggested. i immediately got defensive and started to type a response, then i’d erase it. i started again, and again – but every response felt defensive. i don’t have a need or desire to defend my purse collection. if anyone thinks that my large collection makes me selfish, a hoarder, vacuous, materialistic, or whatever, that’s fine. i know myself and the good and bad i do in the world. after a day of struggling with that comment, i’m at peace. so is my soul. for now. i do have a kid about to graduate, remember? the peace doesn’t always last for long, but i certainly know how to seek it and find it. and on that note, i’m headed to church for Pentecost. peace. This entry was posted in thrifting and tagged brown, Episcopal, God, goodwill, Goodwill Industries, Handbags and Purses, Holy Spirit, Jesus, peace, Pentecost, soul, ugg on May 19, 2013 by miriamgmck. I love this purse! 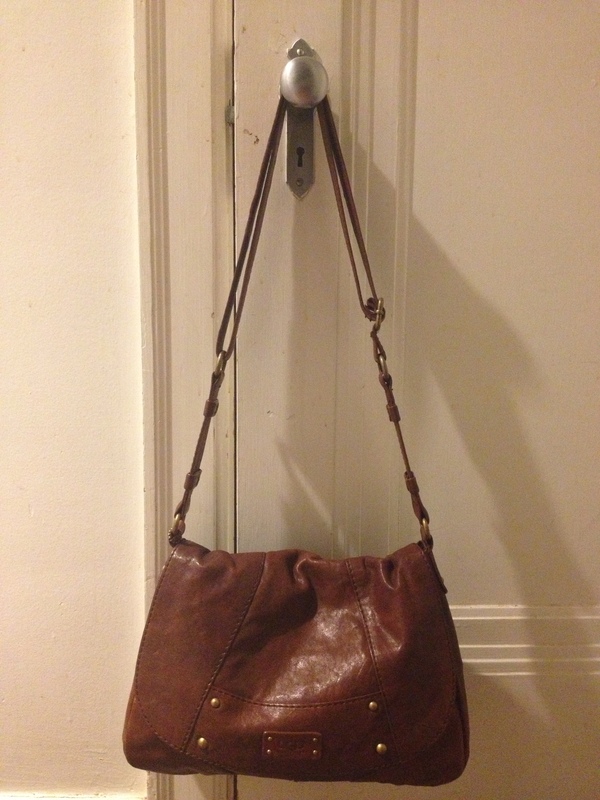 I thrift purses a lot and then sell them on Etsy, but it’s hard to part with them every time! Even though I know they are going into good hands! Keep this purse! KEEP IT! Zhenya, thanks for the support! I’m definitely keeping it. There are some others, though, that didn’t make the top 50 that will be going. that’s sad that someone would make such a judgmental comment about cleansing one’s soul. it would be hard not to be defensive, because really, what were they trying to say? Besides if you were to get rid of them, you’d have to buy 50 more bags to make up for your collection, so you’d wind up wasting money in the long run.